Pinterest has become one of my most favorite things in the whole wide world! I have a plethora of boards for decorating, altered art, cleaning, foods, style and most recently I added Gotta Try This. There are a gazillion DIY pins that I weed through and every so often one catches my eye. I thought this would be a perfect forum to check these out for myself and report back on how it worked for me. So, welcome to my new monthly series, GOTTA TRY THIS! Beginning in September, the last Thursday of each month will feature a pin that I have tried out. Hope you enjoy and you can follow my pins here. Here is the original pin. 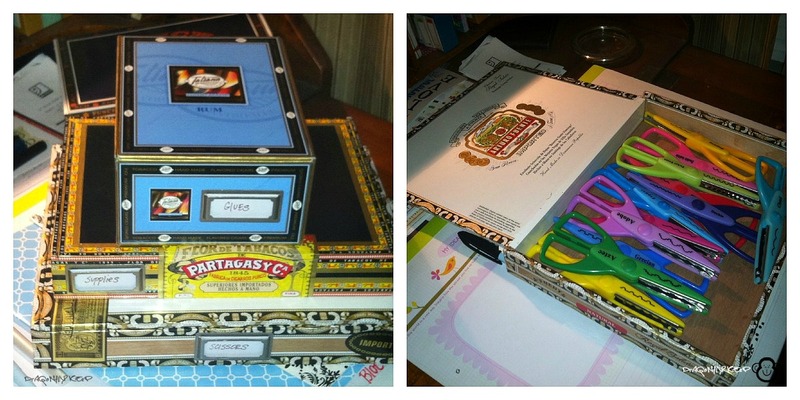 It was a DIY using cigar boxes as storage. Instead of using drawer pulls I used Martha Stewart Home Office™with Avery™Adhesive Metal Bookplate to categorize the items in the boxes. I like the eclectic look the cigar boxes give my studio. They are generally free at local smoke shops and I plan on getting more for storage in the future. I am starting to see them at the thrift shops but will only buy them if they are on a $! color tag day since I don’t want to spend more than a dollar if I have to. My daughter adores Pinterest. Her big things on there are food, hairstyles, and funny or Inspirational quotes. I like it. I just need to use it more. My daughter loves Pinterest. Her main interests are new recipes, hairstyles, and funny or inspirational posters. I like it, but need to implement it more often.